The Federation has access to superior weaponry. A Constitution Class Starship from Kirk's era could enact General Order 24 - an order to destroy all life on an entire planet. Thus, the weapons on one single such a vessel must be sufficient to accomplish this, on its own. The Federation has a wider array of tools available. Star trek ships weapons fire in all directions in a 360 degree arc. Their ships are smaller but they can attack any direction regardless of ship facing. Star wars ships are much larger such as the Imperial Star Destroyer at 1600 meters, but the weapons in star wars are point direct weapons like old school naval vessels. A single Federation Starship can reliably scour the surface of a planet and sterilise it of all life (see General Order 24, in several episodes of the Original Series). Their weapons are capable of cracking the crust and disrupting the mantle. They have no need of a ground attack. 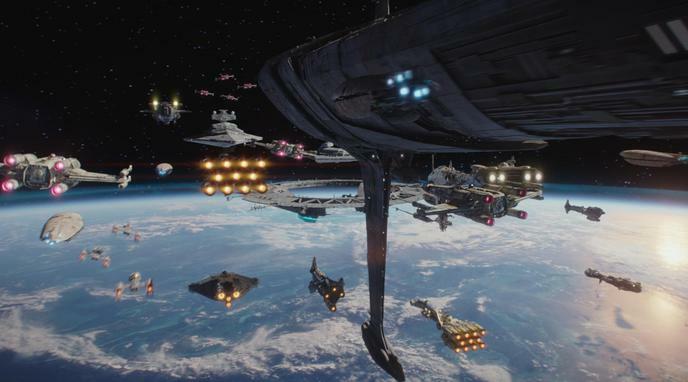 This is more than any single capital ship in Star Wars is capable of, showing marked superiority in weapons power to even older and smaller Federation vessels. Unlike Star Wars ships, which require trained gunners, Star Trek ships are capable of automated point-defense. torpedo) weapons at it's disposal, far greater than those in Star Wars. Although they are not the primary weapons of Federation craft, it is worth noting that the Federation have access to other weapons too. All of these can also be deployed as cannons with burst mode. Though it would require them to refit their ships, it means they can likely find more effective weapons if phasers prove insufficient as well as giving them a greater range and variety of weapons. And If one weapon were ineffective, they would have others that likely wouldn't be. Star Treks phasers are almost as powerful as their torpedoes, though the energy is focused to a point and thus less useful as a tool of mass destruction. They suffer no degradation in power for range or any appreciable dispersion. Atmosphere's also do not interfere with them for bombardment purposes. Turbolasers on the other hand, suffer power drop off for range (as plasma weapons, due to dispersion and heat loss). photon torpedoes are 1.5kg matter-antimatter explosives. Even the least generous estimate makes this equivalent to a 64.4MgT nuclear weapon. 300,000km-4,500,000km. Star Trek outrange the rebels by at least 50 times minimum. torpedoes could seriously hamper a Star Trek vessel leaving it a sitting duck. If all power fails a Federation ship would be dead in the water, and without those powerful shields and other subsystems holding it together, a Rebel cruiser could slice it to ribbons with its turbolasers. The Rebel Alliance has ion cannon technology. This renders the electrical systems of an enemy ship inoperable. The energy shields of Starfleet vessels would collapse.